Want to minimize maintenance on airport runways? Do you want to minimize maintenance on airport runways? Airport construction projects are usually under great time pressure. Time is money, certainly in your business. It is therefore important that air traffic suffers as little as possible from maintenance and repairs. Airport operators and technical/maintenance personnel are continually faced with problems involving concrete runways, aprons, washing area’s and loading/unloading platforms. These floors are often driven over by heavy equipment, are exposed to changing (weather) conditions and to micro-biological or chemical influences. SABA provides for a substantial improvement in the joint seals in concrete aprons and taxi/landing runways, resulting in lower total costs and higher returns on your airport. We focus on the efficient processing and fast curing of our products in order to make runways quickly accessible again. SABA joint seals that were made more than 25 years ago continue to perform perfectly today. This makes the SABA concept one of the most durable sealant systems in the world. 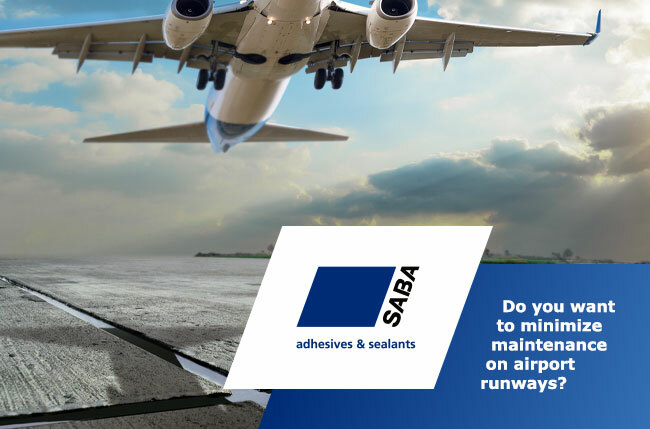 Want to learn more about SABA airport sealants? Visit our website or get in contact with us through building@saba-adhesives.com. We look forward to seeing you at the Airport Show Dubai in the Zaabeel Hall 5 at Dubai International Convention and Exhibition Centre on May 7, 8 or 9. Register here for free entry and visit SABA at booth 5551.